Correction:The previous headline stated that the new shipment that has arrived in Germany included hundreds of tanks. 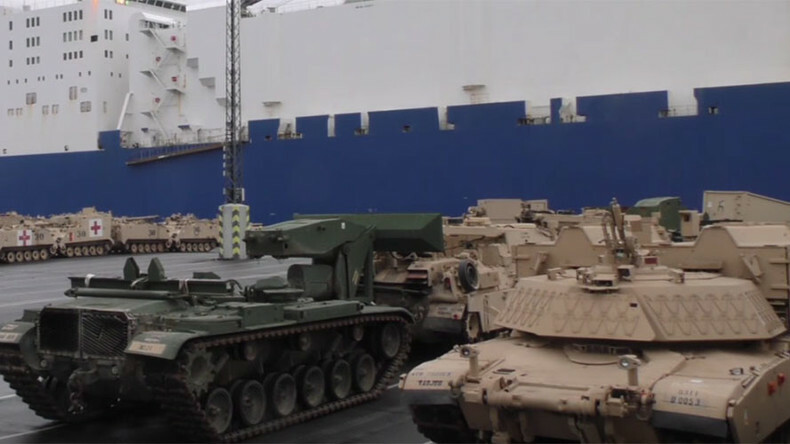 The headline has been since corrected to reflect that the number included not only tanks but also military hardware that has arrived at the German port of Bremerhaven. The delivery of US Abrams tanks, Paladin artillery and Bradley fighting vehicles mark a new phase of Operation Atlantic Resolve. Over the last few days 2,800 pieces of military hardware and 4,000 troops have arrived at the port. The delivery marks a new phase of continuous American presence in Europe which will now be conducted on a nine-month rotational basis. “What is significant about this deployment is this brigade combat team is bringing all of their equipment from the States,” added Deputy Commanding General of the US Army Europe, Major Tim McGuire, who explained the deployment enables the US Army to build “additional readiness” and as well as boost combat preparedness of its NATO allies. The new forces will first be moved to Poland to participate in military drills at the end of the month, before being deployed across seven countries, including the Baltic states, Bulgaria, Romania and Germany. A headquarters unit will be stationed in Germany. As part of the new force, the US Army will also dispatch about 50 Black Hawk and 10 CH-47 Chinook helicopters along with around 1,800 personnel, and a separate aviation battalion with 400 troops and 24 Apache helicopters. In addition to American troops going to Poland, Germany, Canada and Britain are also contributing to the significant NATO forces buildup in eastern Europe and are sending battalions of up to 1,000 troops each to Estonia, Latvia and Lithuania. Atlantic Resolve is perceived by Washington as a demonstration of continued US commitment to the collective security of Europe which began in April 2014, following the Crimean referendum to split from the coup-stricken Ukraine and join Russia. The ongoing strategy is promulgated by conducting continuous, enhanced multinational training and security cooperation activities with US and NATO partners in eastern Europe. Since the Operation began, these military exercises have been conducted in Estonia, Latvia, Lithuania, Poland, Romania, Bulgaria and Hungary. Russia has long condemned NATO’s activities along its borders as hostile and potentially threatening national security. Moscow has responded by stationing its most modern weaponry and armaments on its western borders, including the enclave region of Kaliningrad, and staging large-scale military drills on home soil.